Verlene F. Cole Waldrop, daughter of Lyston L. Cole and Eula Olene Morrow, married to Roy G. 'Tommy' Waldrop and buried in Grandview Memorial Park Cemetery, Pasadena, Harris Co., Texas. 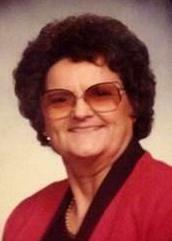 VERLENE WALDROP passed away on February 1, 2015. Verlene was born July 12, 1927 in Wingate, TX and graduated from Bradshaw High School. 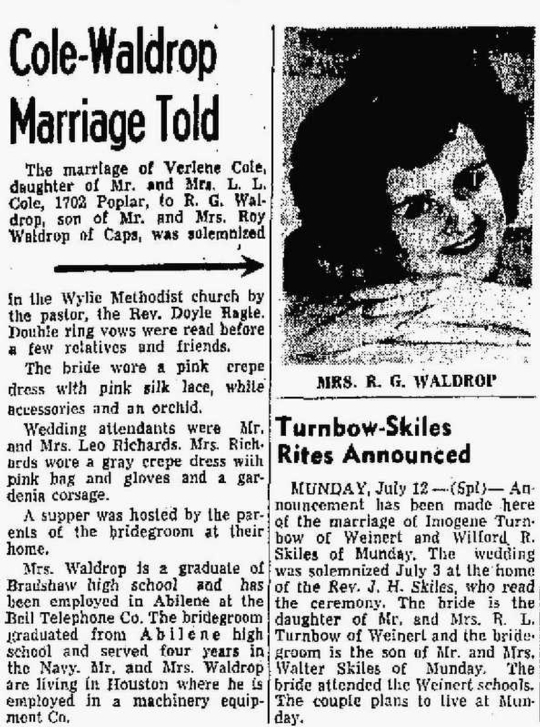 When she married Tommy Waldrop on July 5, 1947, they lived in Abilene, TX. After marriage, they moved to Pasadena, TX and lived there until Verlene moved to Alvin,TX in 2012. Verlene was a lifetime member of Eastern Star Chapter 711. She was also a member of First United Methodist Church Pasadena. Verlene will always be remembered for her concern and kindness for others, and as a wonderful friend to many. Verlene is preceded in death by her husband Tommy Waldrop, and daughter Diane Webb. She is survived by daughter, Judy and husband Mike Tidwell of Alvin, TX; sister, Kaye and husband Charles Thornton of Springtown, TX; grandchildren, Stacy Thompson, Shannon and husband Pascual Frausto, and Heather Webb; great grandchildren, Taylor Tidwell, Kaden Underwood, Averi and Chad Sills, Pryor Warren; and numerous nieces and nephews.